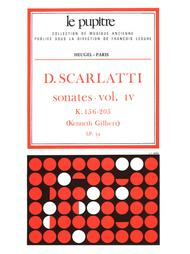 Italian composer, Domenico Scarlatti (1685-1757) is well-known for his Keyboard compositions. His 555 Keyboard Sonatas remain ever popular to this day, and it is for this reason that this fourth volume is indispensable to performers of the genre. Originally composed for the Harpsichord, Organ or early Pianoforte, the Sonatas display the riveting use of discords and unconventional modulations to remote keys. It is also thought that much of Scarlatti's Keyboard music contains influences of Iberian music, considering that he spent much of his working life in the service of the Spanish and Portuguese royal families.The fourth volume, comprising Sonatas 156-205, includes the popular and recognisable Sonata in C major (K. 159). Bearing in mind that Domenico Scarlatti was a highly competent and popular Keyboard player in his day, so much so that he was employed in the service of two royal families, his Sonatas are composed with much experience, understanding and expertise, creating an essential addition to the repertoire of all Keyboard players of the Baroque genre.